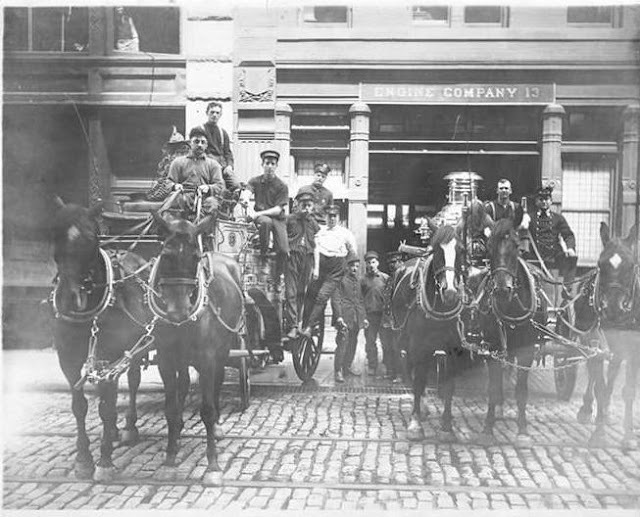 Before 1865 New York City’s fire fighting was done by a disorganized collection of volunteer companies. When a fire broke out, young men from the neighborhood called “laddies” would scramble to the fire house. Nearby fire houses would often vie with one another to arrive at the fire first, or to become more skilled at extinguishing it. The volunteer groups gained a reputation as rowdy, boisterous gangs whose fire houses were essentially social clubs. In the 1840s the Ward family lived in the house at No. 99 Wooster Street. Brothers James and Samuel shared an office at No. 270 Spring Street—James was a doctor and Samuel a druggist. Their widowed mother, Sarah, rented out a room in the house to carpenter Asher Clapp. But in 1853 the house was gone, replaced by the firehouse of the volunteer Oceanus Engine Company No. 11. An 1859 roster reflected the blue-collar occupations of its men—including butcher, coach-maker, hackman, carpenter, oysterman, housesmith, hatter, cartman and stair-builder among them. The devastating fire that destroyed Barnum’s Museum in 1865, along with pressure on the State Assembly by reformers, resulted in the Act of 1865 that coupled Brooklyn and New York with a paid, united “Metropolitan District” fire department. On November 2 that year it was announced that the Metropolitan Steam Engine Company No. 13 “with horses” had taken over the old Oceanus firehouse. W. H. Wilson was appointed foreman, earning him a salary of $800 a year. The company received a new engine and tender the following year. By 1881 the old Oceanus house was both outdated and inadequate. The city opted to update the old structure. Two years earlier Napoleon LeBrun became the official architect of the New York City fire houses. In 1880 his son Pierre joined him in the business, creating the firm N. LeBrun & Son. LeBrun & Son followed the typical firehouse pattern in what was essentially the rebuilding of the old structure. Its cast iron base was dominated by the centered truck bay. The upper stories were clad in red brick, trimmed in stone and terra cotta. At the second floor a wide floor-to-ceiling opening allowed hay and other supplies to be hoisted up and inside. While some of Napoleon LeBrun’s firehouses would border on the opulent; No. 99 Wooster Street was more utilitarian in design—its most striking feature being the quilt of floral terra cotta squares below the cornice. Terra cotta tiles, interrupted by by a splayed brick lintel, were the highlight of the design. Those machines and fire fighters would see terrifying blazes over the years. And the bravery of the men of Engine Company 13 would often entail their risking their lives. On January 20, 1893 an enormous fire destroyed the Rowland Storey & Sons’ storage warehouse at Washington and King Streets. Injured in the building collapse were Captain Daniel Lawler and firefighter Michael Wall. Lawler would be back in the hospital following another conflagration on November 5, 1895. The fire destroyed two bank buildings at Bleecker Street and Broadway and damaged others. The intense heat drove firefighters back and some were overcome by the smoke and heat. Cable cars on Broadway were stopped. 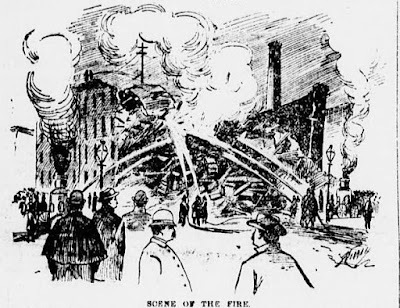 Among those injured was Fireman George Coleman, of Engine Company No. 13; but 38-year old Lawler “required more attention than any of the other patients last night on account of the multiplicity of his wounds,” said the newspaper. On the night of May 11, 1903 Lieutenant George J. Irving was looking out of a top floor window at the firehouse when suddenly a window on the fifth floor of the factory building next door, at No. 97, blew out. Several other fire fighters were standing in front of the firehouse as thick smoke poured out of the building. Upstairs, on the seventh floor, petticoat manufacturer Benjamin Lustgarten and two of his employees, Max Weissner and Benjamin Lerner, were still at work and were trapped. Lieutenant Irving ran to the roof of the firehouse and dropped a rope to the firefighters on the sidewalk, who tied a scaling ladder to it. Irving hoisted it up and, floor by floor, ran the ladder up to the men who were gasping for fresh air. Soon other firefighters were on the roof with ladders and “Irving handed the men down to the firemen, who took them to the roof of the firehouse and to the street.” Although Lustgarten was partially overcome by smoke inhalation, he was revived. Fire fighters here discovered another blaze on the block just after midnight on April 10, 1920. Fire had started on the second floor of the large factory building at Nos. 116-118 Wooster. As a “rescue party” led by Lieutenant Kilbride started up the fire escape in the rear of the building, windows on the upper floors blew out from the intense heat. Sharp shards of glass showered down on the men, all of whom were injured, most seriously Fireman John Millward whose left wrist was slashed. He was attended to in the engine house by the Department physician who “stopped the flow of blood from severed veins by means of a tourniquet,” reported the New-York Tribune. As the other injured firemen were treated, their fellow fire fighters continued to fight the blaze—requiring a second and then a third alarm. When the last sparks were extinguished, the damages to the building were estimated at around $50,000—around $600,000 today. Prohibition was the indirect cause of a nearby fire on December 6, 1921. A private watchman saw flames coming from a grocery store in the ground floor of a tenement two blocks away at No. 101-103 Thompson Street at 4:30 a.m. and ran to the firehouse. One of the men at the fire that night was Lieutenant John J. Schoppmeyer, who had already had a brave and colorful past. He was a veteran of both the Spanish-American and Boxer Wars, and had served as a member of the New York City Police Department for a year before becoming a firefighter. Six months after the Thompson Street fire, he was with Engine Company No. 13 at a dangerous blaze at No. 10 Jane Street on July 17, 1922. Inside the warehouse were not only shipments of German toys and “much rubber;” but large quantities of the chemicals used to make the flash powder used by photographers. As firefighters battled the blaze, the chemicals ignited, causing an explosion that blew the roof off the building. At least 30 persons—firefighters, police and spectators—were injured. The body of John Schoppmeyer was found crushed under the debris. Before the lieutenant’s casket was removed from his home on West 175th Street, 115 members of the Fire Department band filed past to pay their respects. Schoppmeyer had helped organize the group a few years earlier. As the coffin was taken into the Church of the Incarnation on St. Nicholas Avenue, more than 500 policemen and firefighters lined the way. Lt. John J Schoppmeyer received full military and department honors. Founded by dissident members of the Gay Liberation Front two years earlier, the Gay Activist Alliance sought to “secure basic human rights, dignity and freedom for all gay people.” Its means to achieve that goal were highly controversial. Using loud, disrupting demonstrations called “zaps,” it disrupted public events and political speeches. Certain public dissatisfaction with the group culminated on October 15, 1974 when the Wooster Street headquarters was destroyed by an arsonist. In 1988 the old firehouse was renovated to retail space throughout. N. LeBrun & Son’s startling makeover of 1881 survives surprisingly intact—a relic of a time when horse-drawn steam engines clattered through the Soho streets.